Isn't that a festive turkey? It's courtesy of Mr.London. When he arrived the day before Francegiving, he had a few hours to kill before Gregory came home so I decided to keep him busy (idle hands and all). I asked him if he would like to help with the table place cards and he happily obliged. For over two hours Mrs. London and I didn't hear a peep out of him. We had no idea he liked to color so much, he basically became this kid for the afternoon. At least now we know how to keep Mr.London's little hands out of trouble. For Christmas I'm predicting Santas or Reindeer or something that can be colored, decorating the table. The next day, Francegiving, we sent the boys out and Mrs.London and I got busy cooking. Since turkey is a pain in the petunia to get in France when it's not Christmas, I opted for a chicken. Turkey or chicken, either way it's poultry and me and poultry aren't friends. I find it icky as you can see by my facial expression in this photo. See, I'm totally grossed out. And I'm also wearing cat ears, because why not. I believe that festive occasions should be celebrated with fun accessories like animal ears and tiaras. I keep saying to Gregory, "You'll shoot your eye out" but he doesn't get the reference. I guess we'll be watching 'A Christmas Story' this holiday season. There is nothing like a digestif to help burn through all of that Thanksgiving goodness sitting in our bellies... even better is when the digestif is lit on fire first. Of course flaming liquer does tend to produce odd behavior on occasion such as; trying to make paper turkeys fly, attempting to recreate the Dirty Dancing lift, and then something that resembles a patriotic princess bag lady. All in all it was a very successful Francegiving. We cooked, we ate, we shared what we are all grateful for, and we laughed until we tuckered ourselves right out. The end. Looks like everyone had a ball, except the chicken. And maybe Mr London's pants. Erm, trousers. I think I'd get along well with Mr London because I f**ken love colouring too. I absolutely LOVE the turkeys! Hahaha you will DEFINITELY be watching A Christmas Story - that reference is essential. Love all your cute place settings! We had to special order our turkey so I know how that goes! What a fun Thanksgiving you guys had! Not that I doubted for one second that it wouldn't filled with wine, laughter and props like kitty ears and tiaras! And was that Charlie Brown on in the background? Perfect. It's officially the holidays when grown adults are watching cartoons. We're all about it over here as well! Your soirées always look so much fun! Looks like the perfect Thanksgiving to me. Francegiving looks more fun. haha. i love your costumes. francegiving sounds like an awesome time! I want one of those flaming digestifs! Hahaha I love everything about this!! 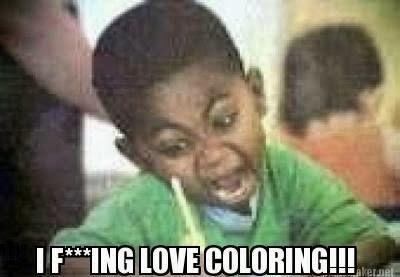 I love this - I'm cracking up about Mr. London's love of coloring. Too cute! This looks like such an awesome time (I mean, cat ears make everything more fun, right? ), and I love the colored turkeys! Have a fantastic week, Sara! Sara that was a splendid Thanksgiving.